(CNSNews.com) - The federal government employed 16,000 fewer people in December 2017 than it did in December 2016, according to data released today by the Bureau of Labor Statistics. State governments employed 19,000 fewer people in December 2017 than they did in December 2016. However, overall government employment in the United States increased by a net 42,000 during 2017 because of the 77,000 jobs added by local governments from December 2016 to December 2017. 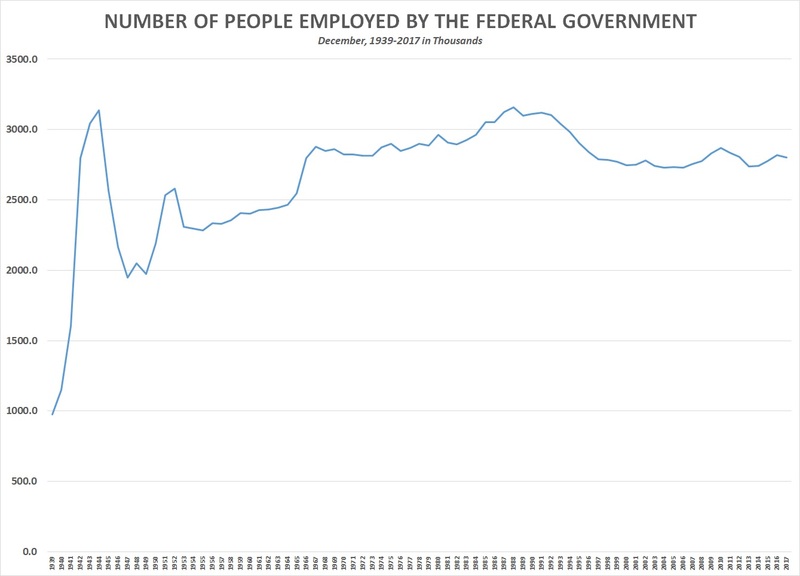 The federal government in December 2016 employed 2,819,000 people, according to BLS. By December 2017, that had dropped to 2,803,000—a decrease of 16,000. State governments in December 2016 employed 5,085,000 people. But, by December 2017, that had dropped to 5,066,000—a decrease of 19,000. Local governments in December 2016 employed 14,395,000. By December 2017, that had climbed to 14,472,000—an increase of 77,000. With federal and state governments dropping a combined 35,000 employees during 2017 and local governments adding 77,000, net government employment in the United States increased by 42,000—climbing from 22,299,000 in December 2016 to 22,341,000 in December 2017. In the years since 1939, according to BLS data, federal employment in December peaked in 1988, when it hit 3,156,000.